The story of the Katz family in Holland during World War II, inspired author Janet Lee Berg to write a historical novel that incorporates some of the experiences her husband's ancestors endured. Immersed in the world of great art, Nathan and Benjamin Katz sold Dutch masterworks to the Nazis. It was a question of survival, according to Benjamin Katz's grandson Bruce Berg. Bruce and Janet Berg live in Mount Pleasant, where Janet has a small office she uses to write. Her book "Rembrandt's Shadow" was published two years ago and is available at local bookstores and from online retailers. Her sequel, "Restitution," is due to be released next year. 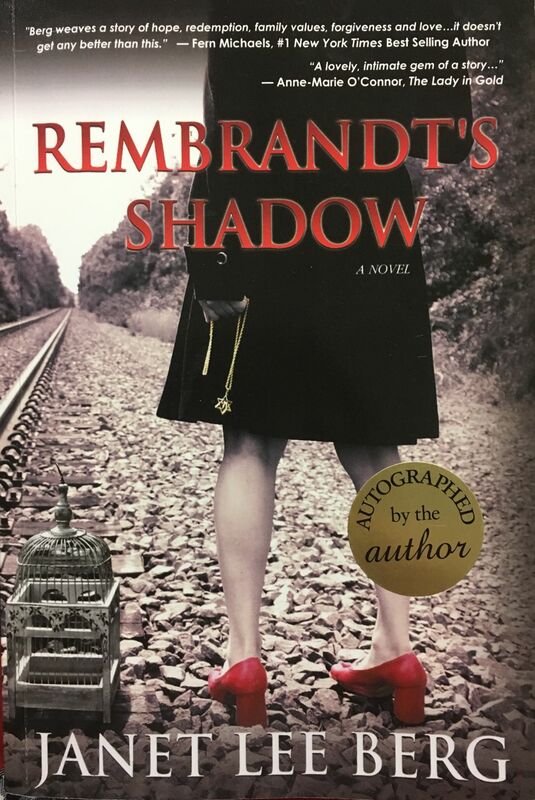 Q: In 2016, you published your historical novel "Rembrandt's Shadow." You started the project with a certain idea in mind, but then modified it when you learned about the experiences of your husband's family in The Netherlands. Tell me how that information changed the book, and how you processed it. A: I started writing a novel in 2002 about a young, free-spirited couple from Long Island, coming of age during the chaos of the Vietnam era. They lived in a town called Massapequa, nicknamed “Matzoh-pizza” home of Jews and Italians. In 2007, we discovered a relative saw paintings in a Dutch museum that looked very familiar and questioned whether the masterpieces could belong to our family. The history surrounding this possibility led to investigating secrets of the past. Q: The novel is a mixture of fact and fiction. Describe that blend, and how history informed your storytelling. A: As the research trickled in over the years, I kept rewriting chapters, weaving both generations and both wars together, with compelling similarities and differences I believe children can learn from in the future. In 2008, we actually visited the old Katz family home, a three-story brick house in Dieren, Holland. I got to see the ghosts of my characters come to life. I imagined the siblings running up the long staircase and the many antiques and heavy-framed canvases on the walls. There were still scraps of wallpaper on the floor and broken blue and white Delft tiles surrounding the fireplace. Q: The compelling true story of the Katz family probably warrants its own telling. Have you considered writing another book, this time nonfiction? A: I have recently been approached by two nonfiction writers, one who wants me to coauthor a book. But, my true passion is fiction, telling ONE story at a time, which represents so many, which allows the souls of people to reach me through words. I cannot wrap my head around numbers and the cold statistics of the deadliest war, which killed 6 million Jews, including one-and-a-half million children — scapegoats of Hitler, who brainwashed a fearful society to believe (the Jews) were the cause of the economic downfall. Not only the Jews suffered, everyone did, including innocent German civilians, and everyone considered undesirable people. Q: It can be difficult to write about World War II and the Holocaust. On a personal level, how did you manage to navigate that terrain? A: It took me 13 years to write two books with my loyal golden retrievers by my side (the sequel, titled “Restitution,” is due out in 2019). With my pen and yellow legal pad in hand, I watched the tears of the victims fall onto the pages. I wrote in their honor. It was my characters, hovering over me in that tiny office, who wrote the words through me. Sometimes it got to me. There were sleepless nights, and there were nightmares, one particularly frightening, when a Nazi monster was looming over me in my sleep. I suppose, I had to look into the eyes of pure evil for the sake of my characters. Two of the Netherlands’ most important art dealers in the 1930s and 1940s were Benjamin and Nathan Katz, who operated a gallery in the city of Dieren called Firma D. Katz. To save Jewish lives, the two men struck deals with the Nazis and sold most of the paintings in their possession. Now, Benjamin Katz’s grandson, a Mount Pleasant resident who operates a record store on John Street in downtown Charleston, is suing the Dutch government in an effort to recover 144 works.